Teddy bear hamsters are incredibly cute and make great pets, the common name for what’s known as the Syrian hamster. The average lifespan of a teddy bear hamster is about 2-3 years in captivity, and less time in the wild. Individual hamster can live shorter or longer depending on their lifestyle, diet, and care. The oldest recorded teddy bear hamster lived for 8 years. The teddy bear hamster is a colloquial name for the Syrian hamster (Mesocricetus auratus), also known as a golden hamster. They are by far the most common variety of hamster and are kept as pets the world around. Due to their ease of raising and fast reproduction cycles, hamsters have also been used as a model organism in the laboratory. The Syrian hamster was first discovered in 1839 in the city of Aleppo, Syria (hence its namesake), but the breed was not fully domesticated until 1939. It appears that all existing laboratory and pet Syrian hamster are descendants of a brother-sister pair that were captured in Syria in 1930. After being bred in Jerusalem, members of the subsequent breeding colony were exported to the US where they became popular house pets. Syrian hamsters typically have short round bodies, stocky legs and feet, and have short silky golden brown fur. There are other individuals of the species who do have different colors, ranging from black to white to spotted and some even have long fine fur that requires special maintenance. They reach about 5-7 inches in length as adults and weigh around 4 ounces (about 1/4th of a pound). Hamsters do have tails, but they are very short relative to their bodies and so are somewhat hidden. 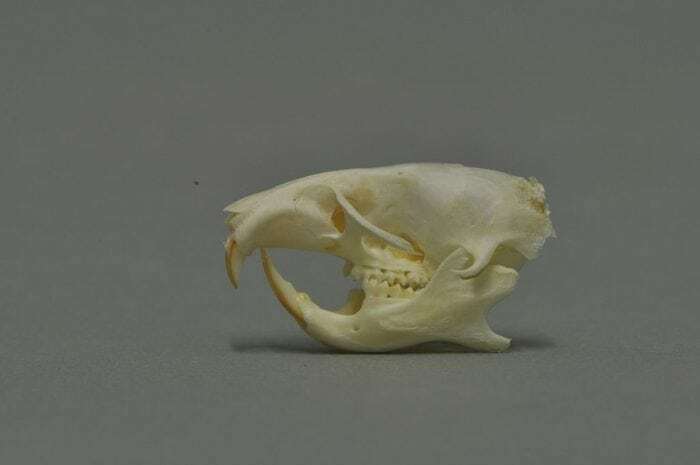 One of the more notable physical features of Syrian hamsters is their long and sharp incisor teeth. The hamster’s incisor teeth never stop growing as they age, so they must be regularly worn down by chewing on things. The sharp teeth also help the hamster chew through tough nuts, seeds, and roots. Large cheek pouches allow the rodent to store extra food. They have poor eyesight as they are both nearsighted and colorblind. Despite their poor vision, hamsters have relatively good hearing and can distinguish between and communicate with sounds in the ultrasonic range. Golden hamsters are crepuscular animals, meaning that they are predominantly active during twilight. In the wild, they spend most of the day underground, emerge about one hour before sunset to look for food, then return back to their underground burrows after the sun sets. They prefer warm and dry spaces, explaining why they were first found near deserts in Syria. During the winter, they enter a state of hibernation where their body temperature drops to 20°C and their metabolic rate is reduced to 5% of its normal levels, which allows them to conserve energy. Technically, hamsters are not true hibernators, as they only go into such a state for periods (“torpors”) of 10-20 days, not for an extended period of time. Hamsters are excellent diggers and are known to create rather elaborate underground burrows with multiple entrances and exits. They even will create specialized rooms meant for sleeping, raising their young, using the bathroom, and hoarding food. Their burrows also serve as useful protection from predators because they are built about 1 meter underground. Domestic hamsters will still burrow if given the appropriate space to do so. Sometimes, hamsters in the wild have been found to occupy the abandoned burrows of other burrowing species. Like mice, hamsters are omnivores and feed mostly on seeds, nuts, small insects, and food that is left behind by humans. They will also eat their own feces to extract any nutrients they might not have initially absorbed. Syrian hamsters are solitary creatures and will aggressively defend their territory against other, especially males. Housing male Syrian hamsters together can cause stress in the animals and lead to fatal fighting. However, they also will become submissive following a social defeat by another hamster as a form of learned helplessness. Hamsters actually have a relatively complex system of endocrine signaling that is responsible for displays of social dominance and submission. This native aggression makes mating Syrian hamsters sometimes difficult. If the female is not introduced when she is in season, potentially fatal fighting will ensue. 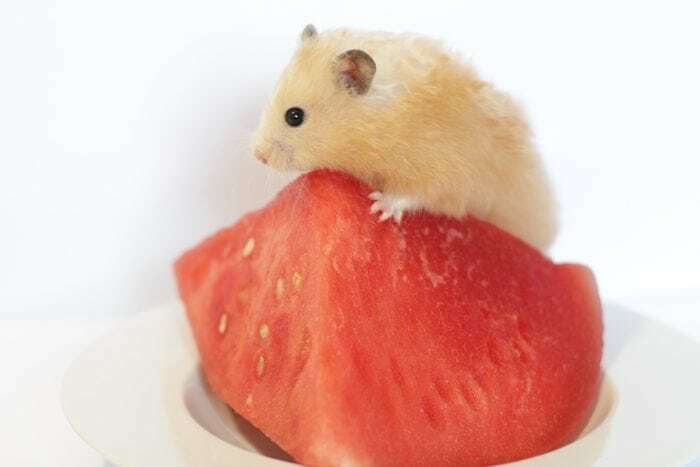 The breeding season for Syrian hamsters in the wild occurs during the spring and summer, but domestic hamsters can be made to breed year-round. During estrous periods, female hamsters will go into heat once about every 4 days. While in this period, they release a number of hormones that lower the males aggression and makes them more receptive to mating. The typical gestation period for offspring is between 16-18 days, and the average size of a litter is 7 pups. Syrian hamster mothers are known to sometimes eat their own young if they perceive themselves to be in danger. Newborn pups reach sexual maturity in about 3-4 weeks. Syrian hamsters are the most common variant of pet hamster around the world. After their domestication and breeding in the Middle East by biologists working in Jerusalem, Syrian hamsters were imported to the United States. and the commercial hamster industry was started in Mobile, Alabama. They also became popular as pets in the U.K. and between the years of 2011-2017, it is estimated that over 3 million hamsters were owned. Their fast reproduction cycles and ease of raising has also made Syrian hamsters ideal model organisms to use in the lab. They are often used to test treatments for various genetic diseases or cancers. In particular, experimentation on Syrian hamsters has shed light on tumorigenesis in human patients with non-small cell lung carcinoma and the progression of various metabolic disorders like diabetes. Hamsters are also of interest to researchers studying circadian rhythms in mammals as they have very well-defined daily routines. Initial research on hamsters determined that the mammalian circadian rhythm is modulated by the suprachiasmatic nucleus in the brain.